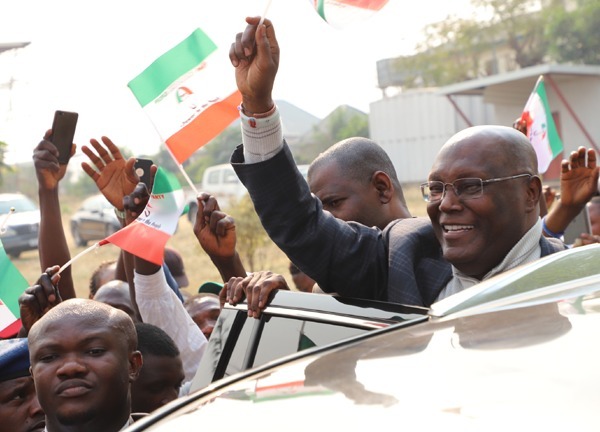 AHEAD of Saturday’s presidential election, the Yoruba socio-political group, Afenifere, on Wednesday in Ibadan endorsed the Peoples Democratic Party (PDP) Presidential candidate, Alhaji Atiku Abubakar, as the candidate all Yoruba people should vote for at the election. The group made the pronouncement in a communiqué issued at the end of a town hall meeting on the theme: “Moving Nigeria Forward”, held at Jogor Centre, Oke – Ado, Ibadan. The meeting was attended by Afenifere leaders, including; Chief Reuben Fasoranti, Chief Ayo Adebanjo, Chief Olu Falae, Senator Femi Okuronmu, Prince Debo Gbadebo, and Chief Mrs. Bola Doherty. In the two – page communiqué read by Hon. Babatunde Oduyoye, the Yoruba socio-political group revealed that the decision to endorse Atiku’s candidacy was as a result of his promise to restructure Nigeria if elected. The communiqué reads: “Afenifere has been advocating for restructuring for some time. Our position and the type of restructuring we have in mind were encapsulated in the document we made public at the submit we held in Ibadan in July, 2017. “We have watched and listened to various candidates vying for the position of president in the election to be held on Saturday, February 16, 2019. We realize that only the Presidential candidate of the People’s Democratic Party (PDP), Atiku Abubakar that has irrevocably committed himself to restructure the country on becoming the President of the country. “We take note of the fact that Alhaji Abubakar is not a new convert to the principle of restructuring. He has been at the forefront of campaign for restructuring for upward of eight years. In view of the foregoing, Afenifere hereby endorses the Waziri Adamawa, Alhaji Abubakar as the candidate all Yoruba people should vote for at Saturday election”. Earlier in his speech, Chief Olu Falae said the reason why Afenifere is not support Vice President Yemi Osinbajo, despite being a Yoruba man, is the the Vice President and his ruling All Progressives Congress (APC) do not believe in restructuring, which the Yoruba apex group has been agitating for over the years. Falae said: “Politics is not about biological relationship, but ideological inclination. Professor Osinbajo, our son has spent four years, and he is saying that what we need is good governance and not restructuring. We want restructuring, but Osinbajo does not believe in restructuring, and that is why we are not supporting his political party. “Alhaji Atiku promised us that he will restructure Nigeria. Initially, we did not believe him because he is a Fulani man, but after holding meetings with him, we were convinced that he is sincere about his promise to restructure Nigeria”. Falae, however, said Nigerians will revolt if the Independent National Electoral Commission (INEC) does not allow people’s votes to count during Saturday’s Presidential election. Similarly, Chief Ayo Adebanjo said Afenifere is supporting the PDP because the political party has now keyed in into the agitation for restructuring.